I will begin this article by stating that there is no such thing as completely “natural” nail polish. While the nail polishes we will feature in this piece are certainly the safest options available, I want to ensure you’re armed with the facts. So why have we included it in this series you ask? Simple. Because women are going to wear nail polish, so I am going to break it down into the safest options for you. But first, a little bit about nails themselves. I have to admit that nails are not my personal forte and it is only upon researching for this article that I have found out some interesting information about our (seemingly insignificant) nails. Our nails are essentially an adaptation of a claw and were perfectly designed to perform functions that aided our ancestors in their very survival. Some of the functions our nails were intended to perform include – but are not limited too – scratching, digging and climbing. While some of the tasks seem irrelevant in our modern society, the reality is we still use our nails for these actions every day without even realizing it. Think, scratching through a handbag and digging out splinters or the likes. So the expression “she has talons” is not that far from the truth! Our nails also enhance our ability to sense pressure. While the nails themselves have no nerve endings, the nail bed does. The nail essentially acts as a counter force, amplifying the ‘information’ we receive when we touch something. Nails (both fingernails and toenails) are made up of a tough keratin – a fibrous structural protein – that is the key material found not only in our nails but also our hair. The keratin, found in our nails, is called alpha-keratin. Our nails also contain 7-12 % water. In a previous article, we have discussed how the skin is the largest organ and that it absorbs anything from 0-100% of what we put on it. As it happens, nails are even more permeable than our skin, despite the common belief that they are an impenetrable barrier. The implications of their ability to absorb potentially harmful ingredients into our bodies is why it is important to consider what products we adorn them with. The practice of painting one’s nails is nothing new. In fact, it dates back to around 3000BC China. While the women of the Ming Dynasty would have used natural substances such beeswax, gelatin, vegetable dyes and Gum Arabic to create their polishes and the Egyptians used henna to stain their nails for ritualistic and aesthetic purposes, modern day nail lacquers are anything but natural. The general make up of modern day nail varnish consists of a film-forming polymer dissolved in a volatile organic compound (not to be confused with “organic” ingredients which imply that the ingredient was grown using organic farming practices – in this instance, an organic compound refers to any compound that contains carbon). Other typical ingredients include plasticizers, for help in creating a flexible film. Adhesive films, dyes, pigments, shimmers/glitters, thickening agents and ultraviolet protectors to enhance and prolong the colour – to name but a few. Our hands are possibly one of the most over looked limbs on our bodies, yet we use them for nearly everything we do. From communication, to eating, painting, holding, caressing, digging in the sand, telling your fortune and even typing this feature. They are also indictors of aging, as all to often we forget to take care of our precious hands. They are home to nails we love to adorn with polish and jewels. 1.) Wash your hands well, and avoid anti-bacterial hand sanitizers wherever possible. Many commercial hand sanitizers have a high alcohol content which is drying on the skin and contain other harmful ingredients. In fact, in September 2016, the FDA (The USA’s Food and Drug Administration) issued a press release banning the ingredients tricolsan and triclocarban – two of the most common active ingredients in hand sanitiser, from over-the-counter antiseptic washes, yet the ingredients are still allowed in consumer products. 2.) Be sure to moisturize you hands after washing and trying. And don’t forget the sunscreen! Our hands are one of the most exposed part of our bodies. Try keeping a tube of Team Dr Jospeh Daily Cellular Hand Protection with SPF10 in your handbag for a great 2-in-1 solution. 3.) Prevent bacteria growing under your fingernails by keeping them as dry as possible. Prolonged exposure to water can cause the nail to weaken and can eventually create splits in the nail. It’s a good idea to used cotton lined rubber gloves when washing dishes or cleaning the house. Not only does it keep the nail dry, it also protects you from absorbing the harsh chemicals find in most cleaning products. Although, if you’re reading this there is a good likelihood you’ve already begun to ditch those toxic cleaning chemicals… that’s a whole other issue. 4.) Trim your nails regularly. Manicure scissors or sharp nail clippers are your best bet. Once you have trimmed the nail, file it into a soft curved shape. 5.) 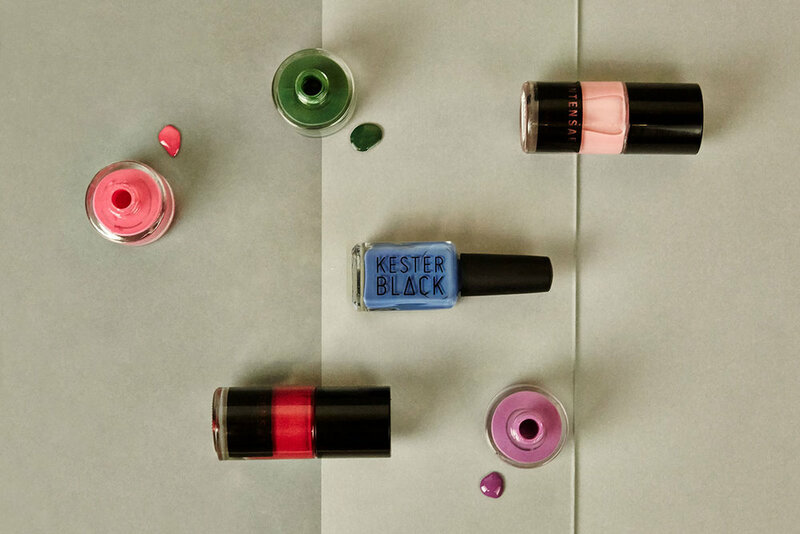 Treat your nail polish as an accessory. Limit how often you wear polish and rather apply it for special occasions and then remove it no more than a week later. Not only because of the potentially nasty ingredients but also to avoid that ghastly “chipped polish” look. Also ensure to wear a base coat to protect your nails from staining. Dr Remedy’s Moisturising Nail Treatment is filled with strengthening and protecting ingredients such as Biotin and the carbohydrate complex Pentavitin. 6.) Go polish free. Yes you can! Don’t under estimate how good a simple buffed nail can look. If you feel the need to lacquer those talons, ensure you choose brands that are the very least, 5 Free (Free from the five most harmful ingredients - Formaldehyde, toluene, DBP, formaldehyde resin, and camphor). Some brands, such as Zao have even managed to create a very effective 8 Free (free from Formaldehyde, toluene, DBP, formaldehyde resin, camphor, xylene, ethyl tosylamide, and triphenyl phosphate polish in a wonderful range of long lasting colours. 7.) It’s not only your hands that require some tlc. Ensure you moisturize the nail and the cuticle well too. This helps to prevent the cuticle drying out, which can in turn leave you with painful hangnails. 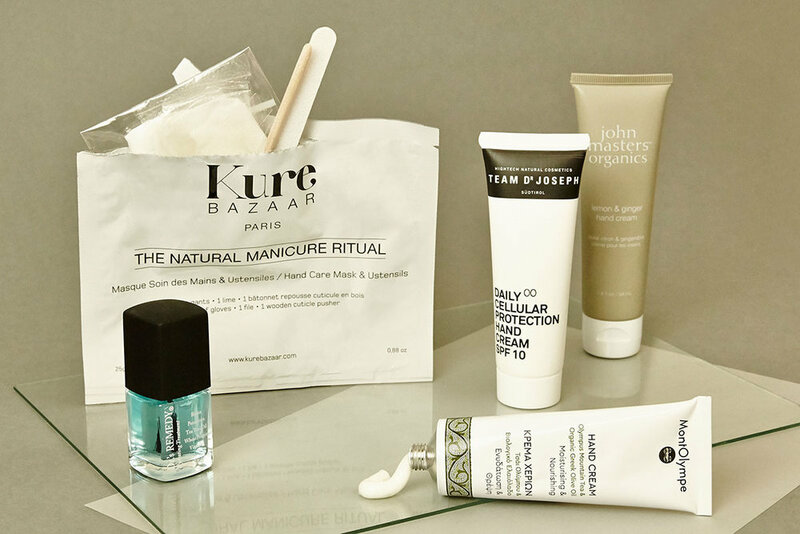 Kure Baazar’s Natural Manicure Ritual is an affordable yet perfect solution to ensure your hands and nails are looking picture perfect for your next ‘nelfie’ (I kid you not, nelfie is a recognized term on social media platforms like Instagram. In short, it’s a nail selfie). Dibutylphthalate is an endocrine disruptor. It can cause irritation of the eyes (lacrimation, conjunctivitis) and upper respiratory tract. If ingested or inhaled it can cause headache, nausea, vomiting, diarrhea, hematuria, dizziness, photophobia (sensitivity to light) and nephrotoxicity. Toluene is a neurotoxin. Its vapours may be irritating to the upper respiratory tract and eyes. Following repeated or prolonged contact, this product has a degreasing effect on the skin. It can cause redness, peeling and cracking. Inhalation of vapours may cause central nervous system depression. Is it really worth it? Formaldehyde is a recognised carcinogen. In 2004 the IARC classified formaldehyde as a Group 1 carcinogen to humans. In Europe, it is classified as "category 3 carcinogen" (possibly carcinogenic to humans), but after a more severe proposal by France, this classification is under review. None the less, who wants to be using embalming fluid before the necessary time anyway? Xylene is an irritating. It can cause mild eye irritation and moderate skin irritation. Inhalation of vapours may cause central nervous system depression. Exposure to vapors may cause irritation of the eyes and upper respiratory tract. Much like toluene, repeated or prolonged contact has a degreasing effect on the skin. It can cause redness, scaling and cracking. That’s never a good look. Colophony (rosin) Irritating and can lead to respiratory disorders. Several cases of skin sensitization have reported. The cases are isolated but quite varied: beauticians who applied depilatory waxes containing rosin, as well as artists who reacted to their stage makeup. Synthetic Camphor is also an irritant, particularly to the eyes and upper respiratory tract if inhaled. I can lead to decreased frequency of breathing, slow heart rate, and symptoms can worsen if inhaled in large doses. So consider those poor nail technicians for a moment. There is no denying that the most effective way to remove nail polish – and its complex list of plastizers, resins, colour pigments and film formers is with the solvent acetone. While our bodies may naturally produce acetone (in minute quantities of course), as an applied solvent, it is incredibly drying and aids-and-abet dried, cracked, splitting nails. Not a good look. 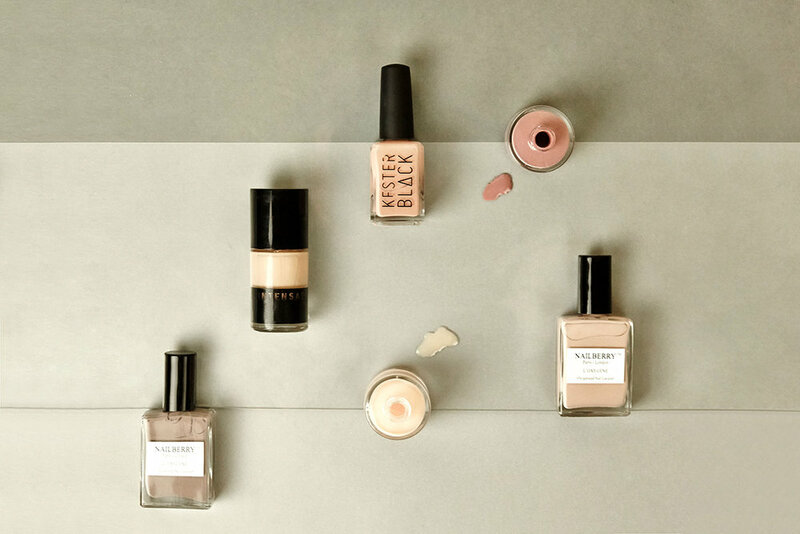 The good news is that if you are switching to nail polishes with more, shall we say, “considered” ingredients, then there are suitable alternatives that contain less damaging solvents in which to remove them with. So be sure to ask for acetone free or natural nail polish remover next time you’re stocking up on your at home mani/pedi products. And, as much as I hate to admit it, if you’re into very dark colours to adorn your talons… you may still need to keep a small bottle of acetone around for emergencies.